Renault Sport Formula One Team's Nico Hulkenberg will start from tenth on the grid for the Formula 1 Grand Prix de Monaco. Nico set the twelfth fastest time in qualifying, a 1min 13.628secs, however penalties for the McLarens bump him up two positions. Jolyon Palmer's 1min 14.696secs was the 17th fastest lap, however he gains one place on the grid to start from P16 tomorrow. 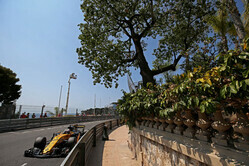 Nico Hulkenberg: "I think that was the best we could have got from the car today. We've been struggling all weekend long with a lack of lack grip and balance which reflected on Thursday's times. We managed to improve the car and I'm really happy with my laps. Tomorrow's likely to be a tough day in the office. You have to stay sharp and on your toes as Monaco can always hold some surprises and you always have to be ready to pick them up in case there are some so we are prepared as normal and try and have a good race." Jolyon Palmer: "I felt quite happy with the car today; even though we haven't looked too competitive, I've always been nip and tuck with Nico through the weekend. I'm disappointed with my qualifying position, but I don't think that's a true reflection of what we can do. I just kissed the wall on my first set of tyres, which gave me a puncture on the rear left. It was all to do on my final lap, but that time wasn't good enough for Q2. The cars are pretty wide and the track is pretty narrow so it's going to be a challenge tomorrow. Anything can happen in Monaco, so let's see what we can do." Alan Permane, Sporting Director: We weren't too happy with our ultimate qualifying pace relative to the opposition, however relative to Thursday's running we've definitely made a positive gain. We've engineered a very good recovery in terms of set-up to mean we're far better placed for tomorrow's race than we would have been otherwise. Nico starts in the top ten thanks to penalties for two cars which qualified ahead of him, so a finish solidly in the points is certainly the target. What are the considerations for tomorrow's race? AP: All the standard Monaco clichés apply: it's going to be difficult to overtake, tyre degradation will be low so one stop will be the norm and there's a strong chance of a number of safety cars. Our job is to keep out of trouble and see the chequered flag. A good start, some positions during the race and a sensible race could see a decent result. Check out our Saturday gallery from Monaco, here.